August 1996 - exactly 10 years have passed since Willi Grimm and Gerard Widmer - brought together in Berne by a mutual friend - met to form the Swiss duo NATURTON. They took their first steps on a musical voyage. The fusion of two cultural identities had begun. "From far away, a gentle wind seems to carry sounds as distant and dreamy as a landscape lost in the mists of time. With the breaking of dawn, colour upon colour emerges from the blue of the night. Silk-soft waves and pearl-like tones ripple above the deep basic tone.That is the Fujara." "A plaintive drone from the depths of the earth. A siren above the hovering groundtone, overtones from everywhere and nowhere. Rhythmically pulsating. That is the Didjeridu." This CD contains excerpts from their first sound document made in 1989 as well as sub-sequent recordings up to 1995. These are not studio performances. They were recorded at different locations, unampli-fied but using various technical resources. Several are so intensely expressive that, despite some tape noise, they are worthy of inclusion in "documentary". In order to retain the authentic character of the music, none of the recordings underwent studio processing. Stages during a 10-year journey. Waves interwoven as a timeless tapestry. The passing of places and periods. 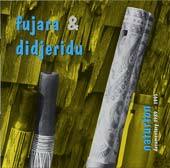 The fujara is a Slovakian folk instrument, a shepherd's flute. It first appeared in the 10th century, but the oldest fujaras preserved are from the second half of the 19th century only. Modern fujara: wooden tube with a length of 165 - 190 cm and a diameter of 3-5 cm.with three holes in the lower part. The air is transported by a smaller wooden pipe of 50 - 70 cm tied to the large tube. The tone is produced by a labium with an inserted block and a cleft (as in a recorder). The nature of the sound: the sound is formed by harmonics (natural overtones, comparable to the alphorn). Fujara melodies are mixolydic, melancholic, with radiantly strident sound clusters. The fujara is commonly played as a solo instrument but also in groups of three to seven, sometimes also with a lead singer. Some contemporary written music for fujara even makes use of string orchestras. The material used for the building of the instrument is semi-hard wood from indigenous trees. The choice of the wood, its storage (two to three years), treatment and decoration require a great deal of care. Each instrument is completely hand-made and individually finished and hence production is limited.